No Christmas Party for Freelancers? No Problem! So what are some of the things freelancers surely won’t miss this season? What full-time freelancers will definitely miss however are the 13th month pays, the long Christmas breaks, and of course, the wild holiday parties where an office mate (or two) hogs the karaoke to belt out “Total Eclipse of the Heart” or "Chandelier" until their throats (and everyone's ears) explode. But fret not, Filipino freelance professional! Top global online jobs portal Freelancer.com has joined forces with local freelancing community Freelancing.ph and premier workshops organizer Manila Workshops to bring you our very own holiday party, especially for freelancers. 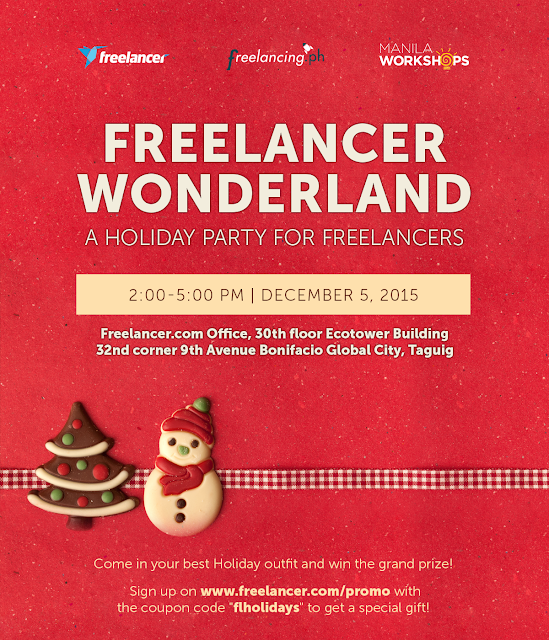 On December 5, Saturday, join your fellow freelancers for a well-deserved afternoon of mirth and merrymaking! Bring food to share and gifts to exchange with your friends! Plus: come in your best Holiday outfit to the Freelancer.com office, 30th floor, Ecotower building, 32nd Street corner 9th Avenue, Bonifacio Global City, Taguig – and get a chance to win a prize! Entrance is free to the event. Simply present your Freelancer.com username at the registration table to get in the party! And if you’re not a Freelancer.com member yet, you can use the coupon code flholidays when you sign up on Freelancer.com to get a special Plus Membership gift which increases the chances of winning freelance projects up to 100 bids—exclusively for the holidays. Good that freelancers in your country now have a choice to go for company sponsored christmas party or not. Yes mun, and this is as well another product of blogapalooza. Hope you enjoy your holiday party or celebration. Have a good time. Relax and enjoy! Thanks nancy, how about you? So are you going to go to this? Wonder what you will bring to eat. Have fun! It sounds as if freelancers are having a swell time. So far, the freelancers that i have met in person are all college graduates from prestigious universities and are desperate and struggling. I'd like to think that i am a struggling starving penniless writer employed in some fast-food restaurant, but i feel like i'm big money whenever i go out with these freelancers. Anyway, maybe it's just me being stuck with the gloomiest creatures of the earth. Wish I could go. I would be the one belting out Sia's Chandelier... Muahahahaha!!!! what do you mean upworkers milton? May ganito pala! Sayang, di ako nakasali. yes there is and it was really fun. I was able to meet and learn from the business.